The following document from the Essex County Court of Common Pleas shows a request from Daniel Hartwell for an attachment of goods valuing $70 from Calvin Bunker. ​Click on the image below to view the full document in a new window. 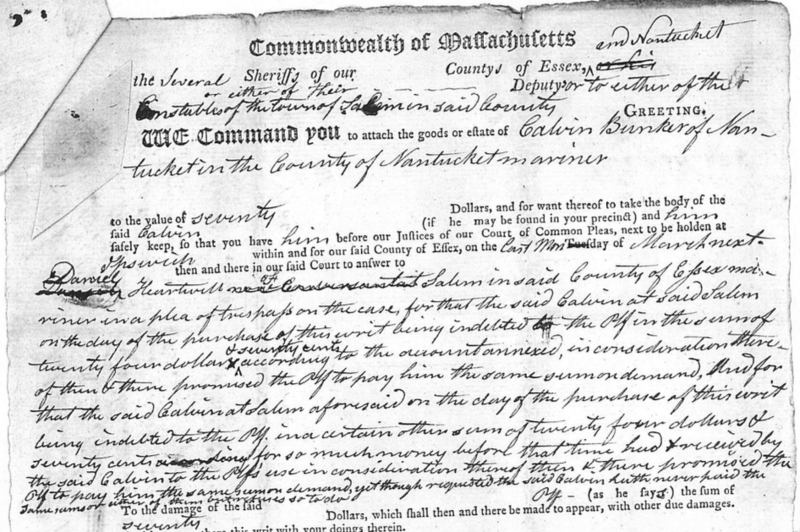 Daniel Hartwell of Salem in said County of Essex, mariner, in a plea of trespass on the case, for that the said Calvin at said Salem on the day of the purchase of this writ being indebted to the Pltf [plaintiff] in the sum of twenty four dollars & seventy cents to the amount annexed, in consideration thereof, then and there promised the Pltf. in a certain other sum of twenty four dollars & seventy cents for so much money before that time had received by the said Calvin to the Pltf's use in consideration thereof then and there promised the Pltf. to pay him the same sum on demand, yet though requested the said Calvin hath never paid the same amount either of them but returns so to do. To the damage of the said Pltf (as he says) the sum of seventy Dollars, which shall then and there be made to appear, with other due damages. And have you there this writ with your your doings therein.